2010 Torch Lake Township Visitors Guide available! 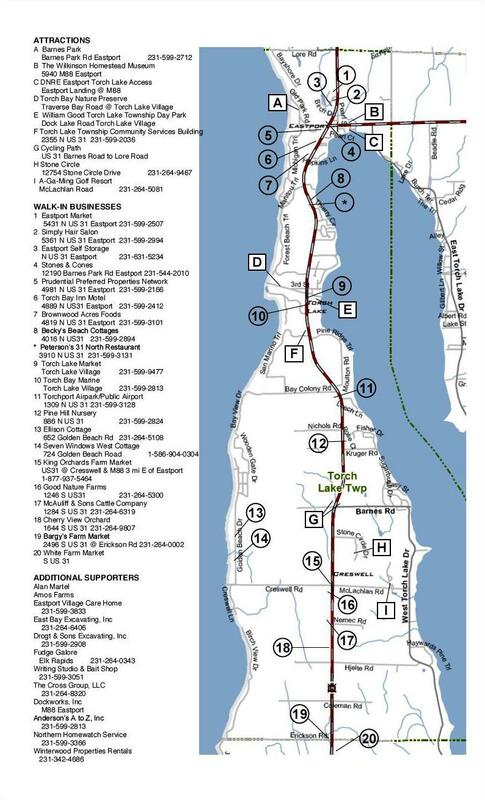 The Torch Lake Township Economic Development Partnership (otherwise known as the Business Bunch) has published a new and improved version of our Visitors Guide. There are lots of business listings and a nice crop of Attractions, too. There is a nice big map! I don’t see how you can go wrong. The Guide is at the printer now, so you’ll have to wait until next week to get your hands on a copy at local businesses. [Update: If you’re reading this, the copies are all over the Township now.] 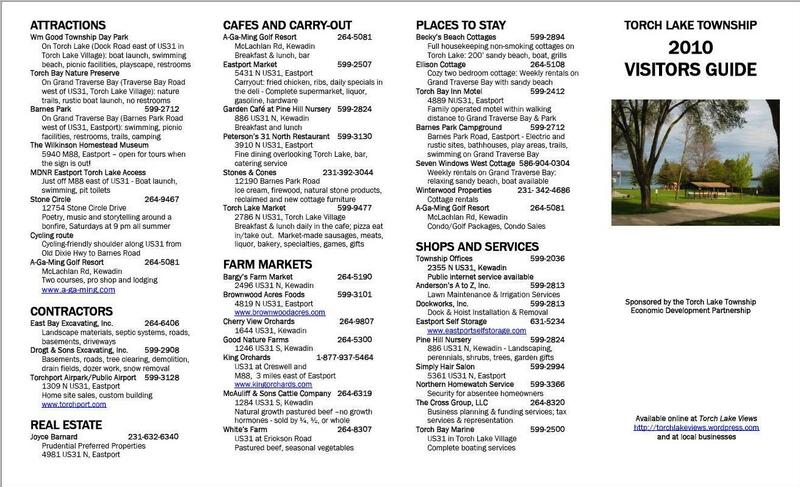 However, as you so wisely keep up by reading Torch Lake Views, you may print out your very own copy at home today. The four-panel brochure is designed to be printed on 14″ (legal size) paper, but you can get your printer to squish it onto 11″ paper if you like. On the other hand, if you’re a patient sort, or if the thought of horsing around with the printing gives you the fantods, you can find copies sometime next week at Chris and Sonny’s Torch Lake Market or at the Eastport Market or at Pine Hill Nursery or at the Torchport . . . you get the idea. Maryanne Jorgensen did a heckuva job keeping the project on track, and Rebecca Norris did a heckuva job making the extremely useful map, which all by itself makes this edition a giant leap forward from our first effort back in 2008. I, um, supplied the photo for the cover. There might be some errors and omissions and I’m happy to hear of them so that I can correct the version that’s posted here. The Visitors Guide is marked 2010 and I noticed that my Bed and Breakfast was not listed on it . I was wondering if someone could add me to the list of places to stay .